What is Christ's way of protecting His church from troublemakers? Is there a way we can "judge" evildoers who creep into local congregations? MILLIONS of sincere but misguided people are mixed-up about the meaning of Jesus' words recorded in Matt. 7:1-5. How often have you heard someone reprimanded for stating his belief that someone else had done wrong by the exclamation, "Judge not, brother. Jesus said we shouldn't judge other people, you know." What about this? Is it wrong, for example, to warn your friends about a certain youth in the neighborhood who is a thief and who you know is a thief because you have caught him in the very act of stealing? The Bible commands us not to bear false witness against another (Exodus 20:16). A talebearer is condemned in God's word (Lev. 19:16; Prov. 18:8). You should always try to help others overcome their sins, and not expose them unnecessarily. But is warning your neighbors about a persistent thief "tale-bearing"? Of course not! What, then, did Jesus mean when He said, "Judge not, that you be not judged"? The way this passage of scripture has been misapplied is a good example of how most professing Bible students often pervert the intended meaning of God's word. Their principal trouble is that they stop too soon, They read just part of a passage of scripture, and then they interpret it. This leads to confusion and differing human ideas. You should let the Bible interpret the Bible. Read ALL the passage in which a verse is contained, and then read the other places in the Bible which further explain the subject. This way you will get God's interpretation — not somebody's human opinion. Using this "key" to unlock the meaning of scripture, we find that Jesus was referring primarily to people like the hypocritical Pharisees who were accusing others of the very things they themselves were doing (verses 3-5). Jesus said that such people should not "judge" or "condemn" others. The Fenton translation renders this phrase "condemn not" instead of "judge not." In the Old Testament, God gave civil statutes to Israel, and the judges had the authority to condemn evildoers to a death sentence. Later, God sent Christ to bring "grace and truth" (John 1:17). "Grace" is the free, unmerited pardon extended by God to sinners. Jesus showed that instead of pronouncing sentence upon sinners, as Israel's judges had in the past, it was now the duty of God's representatives to teach them the right way and command them to repent of the wrong way. In the case of the woman taken in adultery (John 8:3-10), Jesus showed the Pharisees that they were not fit to condemn anyone (verse 7). He was ushering in the dispensation when God's people would no longer be fleshly Israel, but Spirit-begotten sons who would be held accountable by God for obeying even the spirit of the law (Matt. 5:28). Jesus did not "judge" or pronounce sentence upon the woman at that moment. But He commanded, "Go, and sin no more." Human beings are not capable of reading another's mind and heart. But by first overcoming your own major faults, and acquiring spiritual wisdom and experience, you can become qualified to help others recognize and overcome their sins. Speaking of one still laden with faults, Jesus said, "Thou hypocrite, first cast out the beam out of thine own eye; and then shalt thou see clearly to cast out the mote out of thy brother's eye" (Matt. 7:5). First, overcome your own major faults and grow spiritually. Then you will be able to rightly discern other people's sins and help cast them out. Christ — the living Head of the true church (Col. 1:18) — expected His children to help each other overcome sin. When you read all of this passage where Jesus spoke about "judging," you get a far different meaning than those who just read and then humanly interpret the first verse. The real meaning of this passage, then, is that Christians must first grow in the character of God before they are qualified to discern the sins of others and help them to be overcomers as well. But mature Christians should help their weaker brethren overcome their sins. This will naturally involve pointing out sins in others and giving advice and help in overcoming them. Jesus meant what He said. But this must all be done God's way. If you study the subject of "judging" throughout the entire Bible, you will see clearly why Jesus said what He did on this subject. Glancing back into the Old Testament, you will find that one of Moses' principal duties was to "judge" the children of Israel (Exodus 18:13-27). He became so over-burdened with this responsibility that he was forced to appoint other God-fearing men to judge the minor cases (verses 17-22). After Moses died, Joshua acted as a judge in Israel. But later (Judges 2:10-17), a generation arose which rebelled against the judges God set over them. The result was the bloodshed and national suffering described all through the book of Judges. Twice God gives us the major cause of all this suffering: "In those days there was no king in Israel, but every man did that which was right in his own sight" (Judges 17:6; 22:21). Since they refused to hearken to God's judges, Israel suffered because every man acted on human reason — doing what he thought was right. Relying on human reason instead of on God's chosen representatives always leads to disaster. "There is a way that seemeth right unto a man, but the end thereof are the ways of death" (Prov. 16:25). The congregation of Israel is a fleshly type of the spirit-begotten church of God today. The leaders in Israel judged the people, but trouble came when the people refused to hearken unto those whom God had set in authority. Speaking of the children of Israel, the apostle Paul was inspired to write, "Now all these things happened unto them for examples: and they are written for our admonition, upon whom the ends of the world are come" (I Cor. 10:11). Looking toward the future, you will find that the reward of the Christian is a position of ruling and judging the nations. In Rev. 2:26-27, Christ says that those who overcome will be given rule over the nations. The scene depicted in Rev. 20:4-6 shows that the resurrected saints will be given positions of judgment and rule under Christ during the millennium. This thousand year rule of Christ and the saints will take place on the earth (Rev. 5:10). A brief glance at I Cor. 6:1-7 reveals that the saints will not only judge the world, but we will even judge angels! If this be so, "how much more things pertaining to this life?" wrote Paul. Both the example of ancient Israel and the promises of our future reward clearly reveal that God's servants in all times are called on to "judge" and to direct those under their charge. Our whole Christian life is to prepare us to make wise decisions when we are called on to help judge and rule the world under Christ. Our willingness to accept God's judgments and directions in our personal lives — and, when called on, to render them wisely and justly — will be one of the deciding factors which will determine our position in the kingdom of God. How does God's judgment work at this present time? How does it function in His church? Jesus said, "I will build MY church" (Matt. 16:18). Christ is the living, active head of God's church (Col. 1:18). He rules the church through His called servants to whom He has committed the keys of the kingdom of heaven. He has given them authority to "bind" or forbid certain things, and to "loose" or permit certain things. This "binding" or "loosing" may also be applied to permitting or forbidding the admission of persons into the fellowship of the church. Christ gave himself for the church and is cleansing it "that it should be holy and without blemish" (Eph. 5:25-27). Jesus is going to purge sin out of his church that it may be spotless before God. The answer reveals the process of judgment or discipline which God has instituted in His church. Jesus taught the disciples how to keep sin out of the church in Matt. 18:15-20. Read these verses carefully. Verse 15 contains an error in translation. Instead of "if thy brother shall trespass against thee," the verse should read "if your brother sins, go and tell him his fault..." Thorough investigation into the Greek text proves that the words "against thee" should be left out. Jesus was simply teaching his disciples how to bring back a brother who was sinning — whether against them, or someone else, or God only. Notice the three steps Jesus said to take in such a case. First, tell the other person his fault between you and him alone. Don't gossip or tell others. Don't become upset or bitter over your brother's sin. Just go and tell him about it privately. Don't pick at your brother or pester him about trivial matters. But if he sins, go and tell him about it with the attitude of helping him. If he hears you, you have gained your brother. Secondly, if he will not hear you, then take with you one or two other brethren and rehearse the matter again in their presence. Be sure they are mature Christians — men of understanding who will be able to make your sinning brother realize the seriousness of his mistake. Thirdly, if he will not heed their warning to repent, then tell the matter to the church. Since there is order and government in God's true church, you should take the matter up with the pastor. He will carefully review the case, probably have a long talk with the party in error, and will then bring the matter before the entire congregation if he deems this wise. If, after all this, the sinning party still refuses to repent, Christ said that you are to treat him as an unbeliever. Does this mean you are to hate him or to hold him in contempt? It certainly does not. It simply means that you are to treat him as an unconverted outsider and have no fellowship with him. Naturally, you should continue to love your erring brother and pray that God will bring him to repentance. But you are not to talk to him about it or fellowship with him any more until he acknowledges his error and gives evidence that he has repented. If your brother finally does repent and turn from his error, we will find later that he may then be readmitted into church fellowship. So his expulsion from the congregation is simply to wake him up before it is too late. Notice that in this same passage about church discipline, Jesus said, "Verily I say unto you, Whatsoever ye shall bind on earth shall be bound in heaven: and whatsoever ye shall loose on earth shall be loosed in heaven" (Matt. 18:18). Jesus gave His called servants the authority to make binding decisions in such cases. But he went on to say, "For where two or three are gathered together in my name, there am I in the midst of them" (verse 20). Speaking of exercising church discipline, Jesus promised that He would be with His servants in carrying out this function. Christ himself will inspire and direct His chosen ministers in all such decisions. It is really Christ who is governing and judging God's church. Even the judges in the Old Testament were promised divine guidance in rendering their decisions. In II Chronicles 19:1-7 is an account of how righteous King Jehosaphat appointed judges over the land. He was inspired to instruct them, "Take heed what ye do: for ye judge not for man, but for the Lord, who is with you in the judgment." Seeing this example of how God directed his fleshly people, how much more will He direct and inspire His servants today in directing and judging matters within His Spirit-begotten church? Christ will certainly guide His ministers in judging His people today. He intends to present the church holy and blameless before God. The Bible form of church discipline is one of the means Christ is using to keep His church free from corruption. All such judgments by God's servants will be bound in heaven. Christ directs His ministers in governing His church. Then He backs them up with His divine authority and power. Are there further instructions on exactly how this should be carried out? The apostle Paul was inspired to write further instructions about church discipline to the churches under his care. He instructed the Galatians. "Brethren, if a man be overtaken in a fault, ye which are spiritual, restore such an one in the spirit of meekness; considering thyself, lest thou also be tempted" (Gal. 6:1). Notice that Paul admonished them to be meek or humble when helping a brother to see and overcome a sin. We must never be overbearing or self-righteous in such a case, but should humbly try to help our brother correct his error — realizing that we ourselves may be tempted in the same manner. Paul gave inspired instructions to the Thessalonian Christians in his epistles. Knowing that some obstinate persons in the congregation might refuse to recognize his authority and instructions, he wrote, "if any man obey not our word by this epistle, note that man, and have no company with him, that he may be ashamed. Yet count him not as an enemy, but admonish him as a brother" (II Thess. 3:14-15). If a person gets in a wrong spirit and refuses to heed the instructions of God's called servants, Paul showed that they are to be disfellowshipped that they may be ashamed. Learning to obey the government of God is the very basis of true Christianity. People must be taught to respect and fear the authority God wields through His ministers. If a person refuses to obey God's government now, how can he be expected to obey it in the kingdom? In Romans 16:17-18, Paul warned the saints: "Now I beseech you, brethren, mark them which cause divisions and offences contrary to the doctrine which ye have learned; and avoid them." Troublemakers and false teachers are to be marked, and, if they persist, to be put out of God's church and avoided. How much trouble and anguish can be avoided if God's people will heed this warning! In the third and fourth chapters of I Corinthians, Paul was warning the saints against following any individual instead of Christ and pointing out some of the fruits of a true apostle. He warned them nor to take his authority as God's servant lightly. Paul had undoubtedly heard that some of them had become followers of men and were denying his apostolic authority. They were refusing to recognize God's government through him. So Paul wrote, "Now some are puffed up, as though I would not come to you. But I will come to you shortly, if the Lord will, and will know, not the speech of them which are puffed up, but the power. For the kingdom of God is not in word, but in power. What will ye? Shall I come unto you with a rod, or in love, and in the spirit of meekness?" (I Cor. 4:18-21). Do you see that Paul was calling attention to the fact that God grants authority and power to His true servants? Paul knew he had the authority to come "with a rod" — to chasten or put out stubborn sinners from their midst. The POWER of Almighty God would back him up in this! Any who resisted would be struck dead as Ananias and Sapphira if necessary. God's government is with divine power and it is well for all of us to realize this! Paul continued in his letter (I Cor. 5:1-7) to note that a kind of abominable fornication was being practiced among the Corinthians. He commanded them to put out of their midst the one who was committing this sin. He said they should "Deliver such an one unto Satan for the destruction of the flesh, that the spirit may be saved in the day of the Lord Jesus" (verse 5). The clear implication of this passage is that once an obstinate sinner is put out of the church, God will permit Satan to afflict him until he repents — if he will repent. How fearful is the judgment of God on those who know the truth and then let themselves be led into sin and rebellion against God's government! But strict discipline is necessary to preserve the church. Tolerating a small amount of sin will only lead to more. "Know ye not that a little leaven leaveneth the whole lump?" (Verse 6). Paul commanded, "Purge out therefore the old leaven, that ye may be a new lump" (verse 7). Out and out SIN must not be tolerated within God's church! Our human reason might tell us otherwise, but God knows best. Some churches of this world have forms of "excommunication" whereby the object seems to be to hurt and defame the one who has been put out of church fellowship. This is not God's way. As we have seen before, a sinning brother is to be disfellowshipped in order "that he may be ashamed" and come to repentance. The object is to help these people — to wake them up — not to hurt them. In II Corinthians 2:1-11, we find that Paul asked the brethren at Corinth to accept the repentance of the fornicator he had commanded them to put out. "Sufficient to such a man is this punishment, which was inflicted of many. So that contrariwise ye ought rather to forgive him, and comfort him, lest perhaps such a one should be swallowed up with overmuch sorrow" (verses 6-7). These verses indicate that the man had now repented and was sorrowing greatly over his error. He had learned his lesson. So now he was to be brought back into the fellowship of the church and completely forgiven — just as God forgave him. Paul said they must forgive him "lest Satan should get an advantage of us: for we are not ignorant of his devices" (verse 11). If God's people continued to shun this man, he might have committed suicide or perhaps yielded himself to a demon. In either case it would only work harm to the man and bring reproach on the work of God. Here we have found in God's word a complete example of how church discipline should be carried out. It must be strict with persistent sinners or troublemakers, but mercy and complete forgiveness must be extended to those who learn their lesson and repent. The purpose of this form of church discipline is to prevent God's children from becoming careless and lukewarm about SIN — which God hates — and to protect God's church from becoming infiltrated with sinners or false teachers who will lead others into sin. The object of church discipline should be LOVE — the desire to protect any of God's children from being led astray. Jesus — the living Head of God's Church — gave the over-all principles of church discipline to protect the church He was beginning to build. If God's ministers and people today love one another and the truth, they will want to carry out God's form of judgment in His church to mutually protect each other from falling into the snare of Satan. No true Christian has anything to fear from this command of God. It is a procedure designed to protect God's children and keep them bound together in truth and love. In I Corinthians 6:1-7, the apostle Paul commanded the saints not to go to law before unbelievers, but to bring any disputes before the saints for judgment. This would include disputes over material matters as well as the spiritual problems which we have already discussed. Paul wrote, "Know ye not that we shall judge angels? how much more things that pertain to this life" (verse 3). Paul is not writing about cases involving outsiders who are unconverted. This chapter deals with converts only. So when two converted brethren have a disagreement over some material matters — even converted people are still human you know — they should bring the matter before the leaders in God's church. Verse 4 of this passage is incorrectly translated, and most modern translations show that it should be in the form of a question. Paul was asking them why they were bringing their disputes before those who were little esteemed by the church. He continues, "I speak to your shame" (because they were doing this). "Is it so, that there is not a wise man among you? no, not one that shall be able to judge between his brethren?" (verse 5). It is the wise men, then, the ministers and elders in the church, to whom these problems should be brought. Instead of going before worldly courts, Christians should want to have their disputes settled God's way, according to the principles of God's righteous laws. They are commanded to bring all such disputes before the church for judgment. God's judgment will ensure full justice for everyone concerned, and will save the church from bearing any reproach over such matters in the outside world. The apostle Paul specifically states that Christian leaders should be best qualified to judge these matters because they are training to judge the world — to judge angels. Don't you see the great wisdom of God's government and judgment in His church? He is preparing us to rule the world by giving us practical experience in administering and obeying God's government now. The scope of God's judgment includes physical as well as spiritual matters. It is designed to promote and preserve harmony and righteousness among God's people, and to prepare us by experience to become kings and priests in the kingdom of God. Up until recently most of us didn't fully understand the necessity of purging the evil out of God's church. We thought that perhaps God would take care of it without us doing anything. And it seemed like it would be showing more love if we just tried to tolerate evildoers in our midst and hoped for the best. But can we show more love than God? Are our ideas wiser than God's plan? The answer is obviously "no." In his early ministry among God's people, Mr. Armstrong found by hard experience that if sinners are not put out of God's church as Christ commanded, a little leaven does leaven the whole lump. Sin spreads like wildfire if it is tolerated. We must obey Jesus' command to disfellowship those who persist in an outright violation of God's law after they have been warned. False teachers must be "marked" and refused further admittance and association in God's church. This is the command of Almighty God. People who rely on human reason may think this is a lack of love. But this is God's way — and God is love. Each of you brethren will have a part in carrying out God's judgment and discipline in the church as He directs. You must be very careful to do it God's way. Be sure to follow all the steps Jesus gave when you warn a brother of a sin he is committing. Church discipline must be exercised in LOVE. In any such matter, always try to help the other party — not injure him. Ask God to give you wisdom and to help you do everything His way. 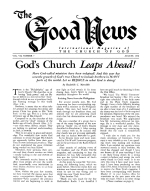 Study carefully all the scriptures in this article. Realize that you have no excuse for continually criticizing or "picking at" anyone in God's church. You are only to go to them in love and point out their mistake if they are literally and definitely breaking God's law. In material disputes, you are to go directly to God's ministers instead of a worldly court. If you love God, this will always be to your best interests. This is God's way — God's command. In all cases, remember that the final responsibility for all decisions rests with God's ministers whom He has called. Christ has promised to "be with" and guide them in every judgment. The judgment is of God. It will be "bound" in heaven. You may be tempted to criticize or disagree with some decision that God's ministers will bind. Be very careful lest you let this turn you against God. You may not understand all the facts. But God's called ministers probably do and they are responsible to Him — not some human — for their actions in directing His church. It is human nature to disagree with God. When the children of Israel rejected Samuel as their judge and leader (I Sam. 8:1-9), God told Samuel, "They have not rejected thee, but they have rejected ME, that I should not reign over them." Be fearful lest you reject God by rebelling against His called servants. God holds His ministers responsible for teaching you His word, and for directing His church and carrying out church discipline. By following God's way of church discipline and judgment, the church of God may go forward in peace and love — and will be purged of all sin to be presented "holy and without blemish" to Christ at His coming.